Packers linebacker Clay Matthews has 7.5 sacks this season but has gotten injured on three of them. 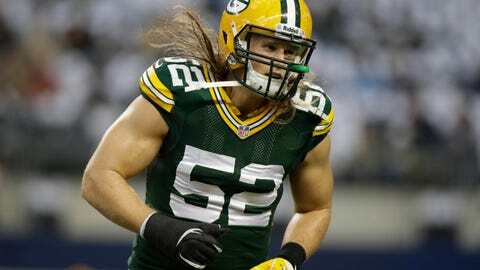 GREEN BAY, Wis. — It’s been known all week that outside linebacker Clay Matthews would be out for the Green Bay Packers’ regular-season finale against the Bears this weekend. However, coach Mike McCarthy announced Friday that Matthews underwent surgery on his re-injured right thumb. "They have not given me a timeline on Clay," McCarthy said before disclosing the surgery. When Matthews jogged off the field in Week 16 following his sack of Pittsburgh Steelers quarterback Ben Roethlisberger, it was apparent that the already surgically repaired thumb had the team’s best pass rusher in agony. Matthews removed his chin strap with his left hand by the time he got to the sideline. Soon after, Matthews didn’t have his helmet with him as he was taken to the locker room for medical evaluation. He did not return to the game — or even to the bench area — in the second half. "Well, obviously he’s not happy," outside linebackers coach Kevin Greene said of Matthews. "He’s not a happy camper. I mean, he’s a professional; he understands that’s the nature of the game. It’s a bad-luck deal. It’s something that everybody, when you step on that field — you take an opportunity — any play could be one that you get hurt. He understands it. It’s a bad deal, so he’s going to move on. He’ll be fine." Matthews was not available for comment in the locker room this week. Matthews initially suffered a Bennett’s fracture of his right thumb when sacking Detroit Lions quarterback Matthew Stafford on Oct. 6. Matthews had surgery the next day and missed the following four games, a span during which the Packers had a 3-1 record. It should be mentioned, though, that those three wins came with Aaron Rodgers at quarterback and the one loss happened in the game in which Rodgers was hurt after the first series. "Well, when you’re a player the caliber of Clay, you’re going to draw a lot of attention," defensive coordinator Dom Capers said. "So, obviously it influences an opponent’s game plan because they don’t want to leave him in a lot of one-on-one situations, so that’s just the way it is. But yeah, I think offenses view you differently when Clay’s not on the field." In the event that Green Bay beats the Chicago Bears on Sunday to win the NFC North, Capers said that he wasn’t sure how far into a potential playoff run Matthews would be out. Strangely, of Matthews’ team-leading 7.5 sacks this season, he’s been injured on three of them. He missed the rest of the Week 3 game with a hamstring injury after sacking Cincinnati Bengals quarterback Andy Dalton and has since added the thumb injuries on sacks. "I joked with him, ‘you’re going to have stop making sacks,’ because every time he makes a sack, he gets hurt," Capers said. "You take those sacks away, maybe he’d be all right." The Packers, who are ranked No. 8 in the NFL in sacks as a team, will now rely on defensive lineman Mike Daniels (6.5 sacks this season), as well as linebackers A.J. Hawk and Mike Neal (5.0 sacks each this season) to pressure Bears quarterback Jay Cutler. "We’ve got young guys who we’ll put out there; those guys will be excited to go out and show what they’re capable of doing, so it’s going to be important for them to play and play well," Capers said. "A game of this importance, everybody’s got to be at the top of their game and prepared to play their best football game."